Not to be confused with Shenmu. Shenmue[a] is an action-adventure game series created, produced and directed by Yu Suzuki. Shenmue and Shenmue II were developed by Sega AM2 and published by Sega for Dreamcast in 1999 and 2001 respectively; Shenmue II was ported to Xbox in 2002. Shenmue III, developed by Suzuki's company Ys Net, is due for release in 2019 for PlayStation 4 and Windows. The Shenmue games consist of open-world 3D environments interspersed with brawler battles and quick time events. They include elements of role-playing, life simulation and social simulation games, such as a day-and-night system, variable weather effects, non-player characters with daily schedules, and interactive elements such as vending machines, arcades, and minigames. The story follows the teenage martial artist Ryo Hazuki as he travels through 1980s Japan and China in pursuit of his father's killer. The original Shenmue was the most expensive video game ever developed at the time, with an estimated production and marketing cost of US$47 to $70 million, though some of the development also covered Shenmue II. Despite attracting positive reviews and a cult following, the games were commercial failures and further installments entered development hell. The Shenmue series was created by Yu Suzuki. 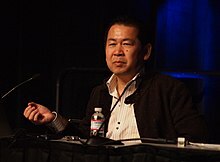 Shenmue creator Yu Suzuki joined Sega in 1983 and went on to create several successful arcade games including Hang-On (1985), Out Run (1986) and Virtua Fighter (1993). In comparison to arcade games, where the ideal experience was only a few minutes long, Suzuki wanted to make a longer experience. In 1996, he and Sega AM2 began developing a Saturn RPG based on the Virtua Fighter series. In 1997, development moved to Sega's upcoming console, the Dreamcast, and the Virtua Fighter connection was dropped. By the time of the Dreamcast's release in Japan in November 1998, the game had been titled Shenmue. It became the most expensive game ever developed at the time, reported to have cost US$70 million; in 2011, Suzuki said the figure was closer to $47 million including marketing. Development also covered some of Shenmue II (2001), which was completed for a smaller figure, and possibly groundwork for future Shenmue games. Shenmue was released on December 29, 1999 in Japan, November 8, 2000 in North America, and December 1, 2000 in Europe. Shenmue II was released for Dreamcast in 2001 in Japan and Europe only; an Xbox port followed in 2002 in Japan, Europe and North America. Despite attracting positive reviews and a cult following, neither game made a profit and Shenmue III entered a period of development hell lasting over a decade. Suzuki remained at Sega working on various projects which failed to see release, including a PC MMORPG spin-off set in the Shenmue world, Shenmue Online, announced in 2004. In 2008, Suzuki established his own development company, Ys Net, while remaining at Sega. In 2010, Sega announced another spin-off, Shenmue City, a social game for the Mobage service. The game was not released outside Japan and was shut down in December 2011. In September 2011, Suzuki left Sega to focus on Ys Net. During Sony's E3 conference on June 15, 2015, Suzuki announced a Kickstarter crowdfunding campaign for Shenmue III, having licensed the series from Sega. The campaign reached its initial $2 million goal in just over nine hours. Shenmue III became the fastest-funded and the highest-funded video game project in Kickstarter history, earning $6.3 million. It is scheduled for release in August 2019 for PlayStation 4 and Windows. Sega described Shenmue as belonging to a new genre it termed "full reactive eyes entertainment" or "FREE". In Shenmue I and II, the player controls teenage martial arts pupil Ryo Hazuki as he investigates his father's murder. The player explores the Yokosuka, Hong Kong and Guilin open worlds, searching for clues, examining objects and talking to non-player characters for information. The games feature a 3D fighting system similar to Sega's Virtua Fighter series; Ryo can fight multiple opponents at once, and can practice moves to increase their power. In quick time events, the player must press the right combination of buttons at the right moment to succeed. The games feature a level of detail considered unprecedented for games at the time of their release. Shops open and close, buses run to timetables, and characters have their own routines, each in accordance with the game's persistent clock. Ryo receives a daily allowance which can be spent on objects including food, raffle tickets, audio cassettes and capsule toys. There are several minigames; for example, Ryo can throw darts or play complete versions of Sega arcade games. In Shenmue he takes a job as a forklift truck driver, and in Shenmue II he can earn money by gambling, arm wrestling, street fighting, and running a pachinko stand. The Dreamcast version of Shenmue II allows the player to import their save data from Shenmue, carrying over money, inventory items and martial arts moves. IGN described the Shenmue story as a "revenge epic in the tradition of Chinese cinema". In 1986 Yokosuka, Japan, teenage martial artist Ryo Hazuki returns to his family dojo to witness a confrontation between his father Iwao and a Chinese man, Lan Di. Ryo intervenes, but is easily incapacitated. Lan Di demands Iwao give him a mysterious stone artifact known as the dragon mirror. When he threatens to kill Ryo, Iwao tells him the mirror is buried under the cherry blossom tree outside. As Lan Di's men dig up the mirror, Lan Di mentions Zhao Sunming, whom Iwao allegedly killed in Mengcun, China. Lan Di delivers a finishing blow and Iwao dies in Ryo's arms. Ryo's investigation leads him to Master Chen in the Yokosuka harbor. Through Chen and his son Guizhang, Ryo learns that the dragon mirror taken by Lan Di is one of two mirrors. He locates the second, the phoenix mirror, in a basement hidden beneath his father's dojo. After he defeats a local gang connected to Lan Di's organization, Ryo boards a boat to Hong Kong in pursuit of Lan Di. In Hong Kong, Ryo finds Master Xiuying Hong, whom Master Chen suggested he seek the aid of. She refuses to help him, considering his quest for vengeance reckless. Ryo teams up with a gang leader, Wuying Ren, a free-spirited motorcyclist, Joy, and a street boy, Wong, to find Yuanda Zhu, who sent Ryo's father a letter warning him of Lan Di's intentions. Ryo and his allies locate Zhu in Kowloon Walled City, but are ambushed by the criminal Yellow Head organization and Zhu is kidnapped. Ryo rescues Zhu as Lan Di departs by helicopter. Zhu reveals that Lan Di killed Ryo's father because he believes Iwao killed his own father. Zhu also reveals that the mirrors will lead to the resurrection of the Qing Dynasty, the last imperial dynasty of China. Zhu advises Ryo to continue his search in Bailu Village in Guilin, where Lan Di is also heading. In the mountains of Guilin, Ryo meets a teenage girl, Shenhua Ling, whom Ryo previously saw in dreams. Shenhua's family is connected to the legacy of the dragon and phoenix mirrors, and she seems to have magical abilities. She leads Ryo to a stone quarry on the village outskirts to meet her father, but discovers he is missing. The pair discover a cryptic note and sword; Ryo combines the sword with the phoenix mirror, triggering a device that reveals a large mural of the dragon and phoenix mirrors. Ryo and Shenhua embark on a new journey, which reveals their shared destinies. Lan Di returns, with a new antagonist Niao Sun. The game will not conclude the Shenmue story, as Suzuki hopes to create further games in the series. The Shenmue series has received mostly positive reviews and attracted a cult following, with both games appearing in several "greatest video games of all time" lists. Shenmue is credited for pioneering several game technologies; its large environments, wealth of options and level of detail have been compared to later open-world games including the Grand Theft Auto series, Sega's Yakuza series, Fallout 3 (2008), and Deadly Premonition (2010). Shenmue is also credited for naming and popularizing the quick time event in modern games, including the Resident Evil, God of War, and Tomb Raider series. Several soundtracks related to the series have been released. A promotional album, Shenmue Juke Box, was packaged with the limited edition of the original game in Japan and North America, containing ten select tracks from the in-game cassette tapes. A soundtrack for the first game, Shenmue OST: Chapter 1: Yokosuka, was released in 2000. In September 2015, Data Discs released the Shenmue soundtrack on vinyl in three separate colored editions. In March 2016, the music of Shenmue was voted into the Classic FM Hall of Fame in 144th place. In August 2018 Sega released high-definition ports of Shenmue and Shenmue II for Windows, PlayStation 4 and Xbox One. The ports include new graphics and control options, improved user interfaces, and Japanese and English voices. Some details, such as product placement, are omitted, and cutscenes are presented in their original aspect ratio due to technical limitations. A more ambitious remaster of both games, featuring new models, textures and lighting, was canceled in 2017. Sega stated: "Working with original animations and characters but meshing them with enhanced HD visuals gave us a game that we felt would not meet the standards that Shenmue fans expect and deserve." Ryo Hazuki is a playable character in Sega's mascot racer Sonic & Sega All-Stars Racing. Ryo rides Naoyuki's motorbike and his special move features him driving a forklift, referencing his job at the Yokosuka Harbor. In 2012, Steve Lycett, executive producer of Sumo Digital, encouraged a fan-made poll on the SEGA Forums to determine which three SEGA characters the fans would like to see in Sonic & All-Stars Racing Transformed as DLC (Downloadable Content). Out of the 28 SEGA characters chosen by the forum, Ryo Hazuki had the majority vote ranking 1st, while Hatsune Miku ranked 2nd, and Segata Sanshiro ranked 3rd. On January 1, 2014, SEGA announced that Ryo will appear in the iOS and Android versions of Sonic & All Stars Racing Transformed which was released on January 2. On January 14, Ryo became available for purchase as DLC on Steam for the PC version of Sonic and All Stars Racing Transformed. In this game, Ryo rides an arcade-themed vehicle that switches between OutRun, Hang-On, and Space Harrier arcade cabinets depending on its form. ^ a b c d "Creator Yu Suzuki shares the story of Shenmue's development". Polygon. Archived from the original on June 28, 2015. Retrieved June 29, 2015. ^ "Shenmue, the History – IGN". Retrieved July 3, 2015. ^ "Shenmue, the History – IGN". Retrieved June 29, 2015. ^ a b c Diver, Mike. "Shenmue – discovering the Sega classic 14 years too late". the Guardian. Archived from the original on June 26, 2015. Retrieved June 30, 2015. ^ "Shenmue: Through the Ages – IGN". Retrieved June 30, 2015. ^ "シェンムー 一章 横須賀 [ドリームキャスト] / ファミ通.com". www.famitsu.com. Archived from the original on December 11, 2015. Retrieved November 28, 2015. ^ "Shenmue (Dreamcast)". IGN. Archived from the original on November 21, 2015. Retrieved November 17, 2015. ^ Barker, Sammy (July 16, 2015). "Soapbox: Why I Love Shenmue". Push Square. Archived from the original on December 8, 2015. Retrieved November 28, 2015. ^ a b c "Yu Suzuki At A Time Of Transition". Archived from the original on November 4, 2016. Retrieved November 24, 2016. ^ Smith, David (August 3, 2004). "Shenmue Online Officially Announced". 1UP.com. Archived from the original on July 18, 2012. ^ Arendt, Susan (August 7, 2007). "Rumor:Shenmue Gone for Good". Wired. Archived from the original on November 4, 2012. ^ Gantayat, Anoop (October 7, 2010). "Shenmue Goes Social on Yahoo's New PC Service". Andriasang. Archived from the original on July 17, 2011. ^ North, Dale (January 3, 2012). "Shenmue City shut down". destructoid. Retrieved January 27, 2018. ^ Skrebels, Joe (June 8, 2017). "Shenmue 3 Delayed". IGN. Retrieved June 8, 2017. ^ a b "Why is everybody so excited? WHAT'S A SHENMUE?". Archived from the original on March 3, 2016. Retrieved June 30, 2015. ^ "'90s Making of Shenmue documentary gives glimpse into legendary game". www.gameskinny.com. Archived from the original on September 22, 2016. Retrieved November 19, 2015. ^ "Shenmue once featured cats that walk on two legs". Archived from the original on October 1, 2015. Retrieved June 29, 2015. ^ "Shenmue Review | Edge Online". May 31, 2013. Archived from the original on May 31, 2013. Retrieved July 3, 2015. ^ "Shenmue II Review". GameSpot. Archived from the original on January 9, 2016. Retrieved November 20, 2015. ^ a b "Shenmue II Review – IGN – Page 2". IGN. Archived from the original on November 29, 2015. Retrieved November 20, 2015. ^ "IGN Presents the History of SEGA – IGN – Page 8". IGN. Archived from the original on November 6, 2015. Retrieved November 18, 2015. ^ "Shenmue III Kickstarter". Kickstarter. Kickstarter. Archived from the original on June 17, 2015. Retrieved June 17, 2015. ^ Arif, Shabana (March 1, 2018). "Shenmue 3 Will Have an Open Ending to Allow for a Sequel". IGN. Retrieved June 16, 2018. ^ "Shenmue Reviews". GameRankings. Archived from the original on January 18, 2008. Retrieved July 18, 2015. ^ "Shenmue II Reviews". Metacritic. Archived from the original on September 1, 2015. Retrieved July 18, 2015. ^ "Shenmue II Reviews". Metacritic. Archived from the original on June 19, 2015. Retrieved July 18, 2015. ^ "7. Shenmue – The 100 Greatest Video Games Of All Time – Empire Online". empireonline.com. Archived from the original on August 19, 2014. ^ "The 100 Greatest Games Of All Time- Shenmue - Empire - www.empireonline.com". empireonline.com. Archived from the original on October 8, 2014. ^ "Tech news and gadget reviews – MSN News UK". msn.com. Archived from the original on March 19, 2014. ^ "The Disappearance of Yu Suzuki: Part 1". 1Up.com. Archived from the original on December 6, 2012. ^ "Retrospective: Shenmue | Features | Edge Online". March 5, 2014. Archived from the original on November 29, 2014. Retrieved July 1, 2015. ^ Diver, Mike. "Shenmue – discovering the Sega classic 14 years too late". the Guardian. Archived from the original on June 26, 2015. Retrieved July 1, 2015. ^ "Shenmue Juke Box". VGMDB. The Video Game Music Database. Archived from the original on May 30, 2015. Retrieved May 30, 2015. ^ "Shenmue chapter 1 -Yokosuka- Original Sound Track". VGMDB. The Video Game Music Database. Archived from the original on May 30, 2015. ^ Summers, Nick. "'Shenmue' and 'Streets of Rage' tunes are headed to vinyl". Engadget. Engadget. Archived from the original on May 30, 2015. Retrieved May 30, 2015. ^ Radio, Global. "Vote for the best music in the world in the Classic FM Hall of Fame". Vote for the best music in the world in the Classic FM Hall of Fame. Retrieved April 14, 2018. ^ "Shenmue's HD re-release gets a final date". Eurogamer.net. Retrieved July 5, 2018. ^ Knezevic, Kevin (April 13, 2018). "Shenmue 1 & 2 Coming To PS4, Xbox One, And PC This Year". GameSpot. Retrieved April 14, 2018. ^ Linneman, John (August 21, 2018). "Shenmue's HD remasters analysed: enhancements are sparse but the ports are solid gold". Eurogamer. Archived from the original on August 21, 2018. Retrieved August 22, 2018. ^ "Revealed: Sega's cancelled Shenmue HD remake - with fully updated graphics". Eurogamer.net. Retrieved October 15, 2018. ^ Mike Fahey. "Sega All-Stars Racing Gets A Little Shenmue". Kotaku. Archived from the original on October 13, 2013. ^ "S0L's Challenge: The Campaign for SEGA characters to become DLC". Forums.sega.com. November 17, 2012. Archived from the original on February 13, 2014. Retrieved May 2, 2014. ^ Powell, Chris (January 1, 2014). "Sonic & All-Stars Racing Transformed hits iOS, Android on Jan. 2". SEGA Nerds. Archived from the original on January 2, 2014. Retrieved May 2, 2014. ^ "Sonic and All-Stars Racing Transformed: Ryo Hazuki on Steam". Store.steampowered.com. January 14, 2014. Archived from the original on April 28, 2014. Retrieved May 2, 2014. This page was last edited on 23 April 2019, at 03:51 (UTC).